After two months of Marvel reviews, it’s time to switch to an amazing creator-owned title. 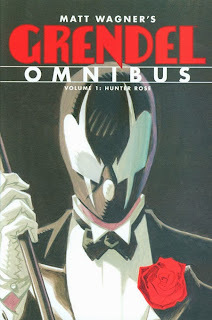 Matt Wagner created Grendel for the now-defunct Comico Comics in 1983; he later took his creation to Dark Horse after the failing Comico attempted to claim the title as one of its assets. The concept is still full of life thirty years later; Wagner will be writing and drawing a crossover with The Shadow later this year. I call Grendel a concept because there’s really not one central character. The “Grendel” name is given to a variety of main characters over centuries; it’s a dark force and possibly a demon from Hell if some of the stories are to be believed.